This post and giveaway are sponsored by Walker’s Shortbread. Chocolate pudding is just the best, isn’t it? Sadly, it’s only been in the last few years that I discovered the deliciousness that is homemade chocolate pudding. Since then, though, I’ve made it frequently, often with Quinn’s urging. It’s just so simple to make that it’s easy to convince myself to make the modicum of effort involved to get a batch whipped up and chilling. 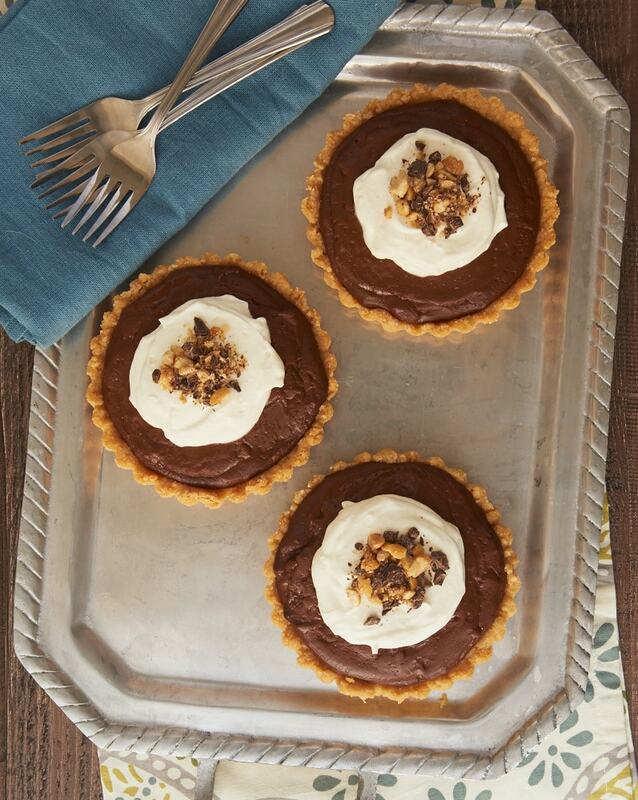 If you want to take chocolate pudding even further, then that’s where these tarts come into the picture. We’re bringing peanut butter and shortbread to the party and turning it all into these beautiful little tarts. I’ve previously made a chocolate pudding pie and even included a layer of peanut butter in it. But here we’re mixing the peanut butter directly into the pudding. 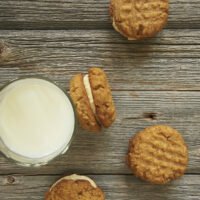 It is a fantastic way to satisfy your chocolate-peanut butter craving. 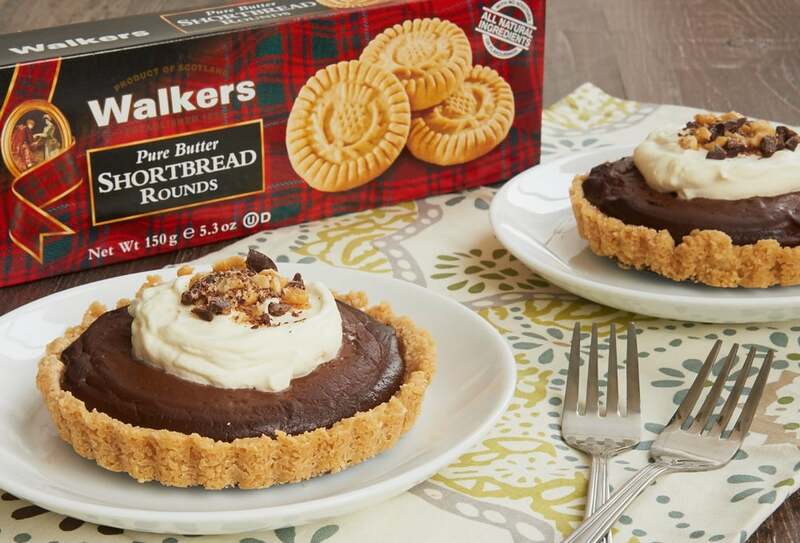 All of that chocolate and peanut butter goodness is nestled inside a simple shortbread crust made from Walker’s Shortbread. Their subtly sweet, buttery shortbread are the perfect companion to that filling. The combination of chocolate and peanut butter is tried and true, but it’s always fund (and delicious!) to find new ways to enjoy it. 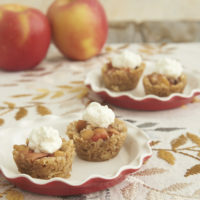 These little tarts are not only super tasty, they are also just lovely and quite elegant. You’ll get four beautiful tarts from this recipe. They are theoretically big enough to share, but I won’t tell if you keep one all to yourself. 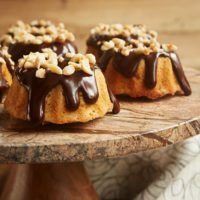 Rich pudding and a sweet shortbread crust make these Chocolate Peanut Butter Pudding Tarts absolutely irresistible! Preheat oven to 350°. Grease four 4.75-inch round tart pans with removable bottoms. Combine the shortbread crumbs and butter until thoroughly combined. Divide the crust mixture among prepared pans. Press the crust into the bottom and up the sides of each pan. Set pans on a baking sheet. Bake 15 minutes or until the crusts are lightly browned. Set aside to cool. Remove pan from heat. Add chocolate, butter, and vanilla. Stir until smooth. 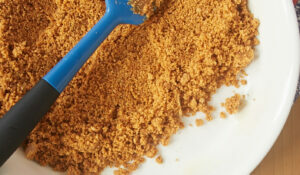 Stir in peanut butter. Divide the pudding among the baked crusts. You’ll use about 1/2 cup of pudding in each tart. Cover with plastic wrap, placing the wrap directly onto the surface of the pudding. Refrigerate for at least 2 hours. 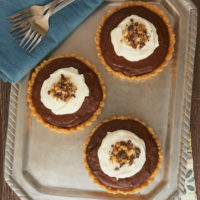 If desired, top each tart with sweetened whipped cream, nuts, and chocolate before serving. Oh my, I can see them disappearing as soon as they are ready. No more cooked dinners, my family will love these. 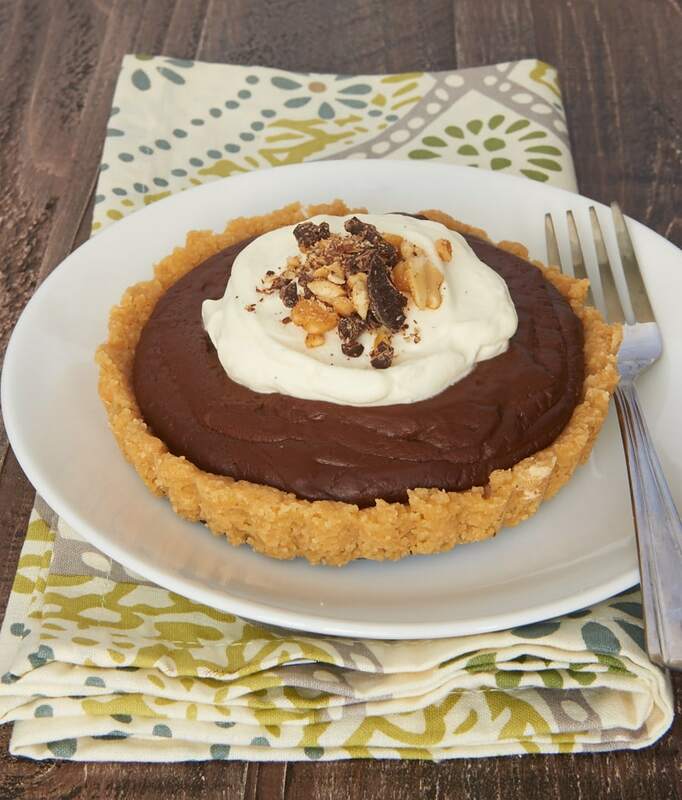 Love pudding pies, and the chocolate-peanut butter combo is one of my favorites. So pretty! 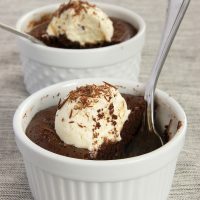 Oddly enough I’m not a huge fan of chocolate pudding by itself, which means however that the additions of the shortbread crust and most definitely peanutbutter are right up my alley! I love that use these shortbread cookies for the crust! Yum! Nothing beats homemade chocolate pudding. 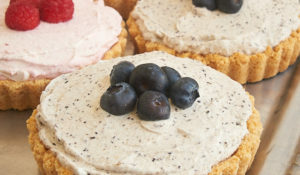 Seriously good These tarts look delish! 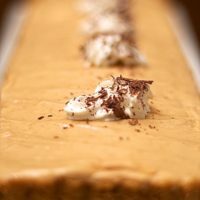 chocolate and peanut butter is such a classic combination, and who doesn’t like this kind of pie? using shortbread for the crust just puts it over the top – yum! Love the idea of the shortbread base (Walkers makes cute little dog shaped shortbread too…) Peanut butter & chocolate combo is the best. I just have a question. Do you think I could substitute Almond Breeze for the milk in the chocolate? Oops! I mean to say in the above comment to use Amond Breeze in the chocolate pudding pie? 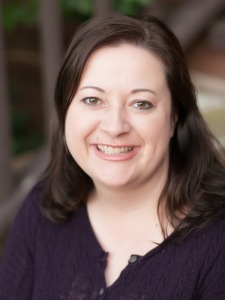 Hi, Brenda. I’ve not tried that, and I actually have never used Almond Breeze at all so I’m not familiar with it. The success of the pudding depends on getting it thickened properly. If the Almond Breeze has different boiling properties, that could affect that. I would recommend reading the brand’s substitution recommendations before trying it. 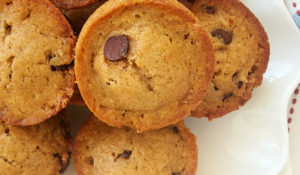 What a wonderful way to combine chocolate and peanut butter. I do love Walker’s shortbread, though I must admit that their stem ginger cookies are what really get me going. 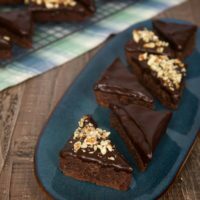 In any event, the idea of individual tarts with a variation on chocolate pudding sounds like heaven to me! This looks wonderful–I so prefer the idea of pudding in a pie or tart. Mmm pudding pie…made even better with PEANUT BUTTER. hooray for adding shortbread and peanut butter to amp up that luscious chocolate pudding!! !